Workers and defenders of human rights are facing growing repression and violence in the Philippines. A CUPE delegation recently visited two of our partner unions to shine a spotlight on these human rights violations and build cross-border solidarity. They also learned about community and trade union organizing to fight privatization and strengthen public services. CUPE has built strong connections with unions in the Philippines over the last decade, including developing Global Justice Fund projects with the Alliance of Concerned Teachers (ACT) and the Confederation for Unity, Recognition and Advancement of Government Employees (COURAGE). Over that time, changes in the political situation have made living conditions worse for most people, and have led to escalating attacks on the rights of trade union leaders and human rights defenders. ACT and COURAGE hosted CUPE’s delegation of leaders, members and staff in mid-November 2018. Members learned about the many serious challenges for workers and most people under the government of President Rodrigo Duterte. Inflation is rising, driven by growing costs of energy, fuel, transportation and water. Real wages are falling, and national spending on social services, education and housing has decreased. These conditions drive more than 6,000 workers to leave the country and have contributed to increasing personal debt. The growing use of precarious contract workers who lack benefits, referred to as contractualization in the Philippines, is a major issue for public and private sector workers. The labour movement is calling for these contract workers to become full-time, permanent employees. President Duterte promised to address the issue during the last election, but more than two years later nothing has changed. COURAGE is campaigning to stop privatization of public services, and for a higher minimum monthly wage. Through their members in the National Food Authority (NFA), COURAGE is also leading opposition to a bill in Congress that would open the Philippines rice market to the world market. This would eliminate the NFA’s power to regulate the price and quality of rice in the public interest. The NFA does for rice what the Canadian Wheat Board did for wheat in Canada before it was privatized. ACT is campaigning for increased spending on education, a pay increase, and reduced workloads. Teachers are poorly paid and often pay for school supplies out of their own pockets. They held their third national sit-down strike in November to back up their demands. Members of the CUPE delegation could relate with the COURAGE and ACT members’ fights against austerity, for better working conditions and in support of the public sector. And we had much to learn about how workers continue to organize and mobilize in the face of violent harassment and repression. Philippines social movements are concerned where the country is heading. The Duterte government has cancelled peace talks, extended martial law, and undermined fundamental pillars of democracy such as a free press. While national spending on social programs is decreasing, the government has increased its military and policing budgets. This spending supports a “war on drugs” which has resulted in the deaths of more than 20,000 people, most of them very poor. The military is also being deployed to suppress resistance to government policies, particularly in indigenous and farming communities. Our delegation met with displaced leaders and students from the indigenous Lumad community, who are protecting their land from foreign and local mining operations and environmental destruction. The Philippines armed forces are occupying indigenous schools in the region, in an attempt to suppress these protests. ACT is a member of the “Save Our Schools” network, a group of national and local organizations that is defending indigenous schools from these attacks. On the heels of our visit, France Castro, a former ACT leader and sitting congressperson, was detained while visiting indigenous Lumad communities on the island of Mindanao. She was later safely released. Trade unionists and human rights activists are on high alert. Duterte has recently said he will crack down on the New People’s Army, a guerilla movement that’s part of a civil war lasting more than 50 years. These statements provide cover for attacks on people advocating for people’s land rights, decent work, and public services. 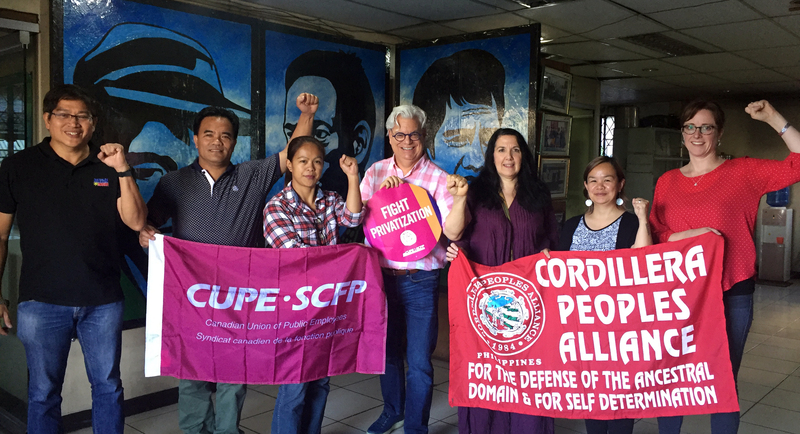 CUPE’s delegation met with trade union and civil society leaders who have faced harassment, as well as with human rights organizations that have documented 195 victims of extrajudicial killings (predominately indigenous people and farmers), and over 500 political prisoners (including members of COURAGE and ACT). The CUPE delegation learned a great deal from the trade union leaders and activists they met, and felt deep admiration and respect for their struggles against huge odds and in the face of police and military repression. CUPE will continue to raise our voice, as Canada’s largest union, in support of their struggles and in solidarity for peace and justice for all.